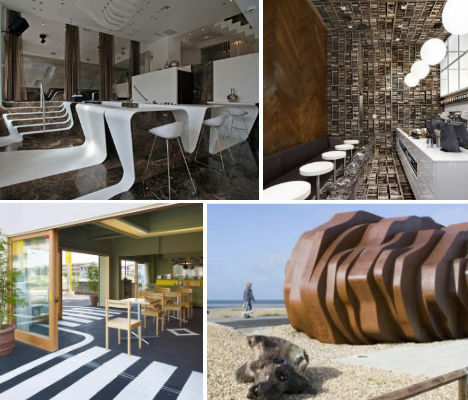 Why spend your time in any old hole-in-the-wall cafe when you could be surrounded by eye-popping, eccentric and beautiful design? These 13 unusual cafes from Poland to Australia defy expectations with strange sculptural installations, shocking colors and prints, brilliant flooring solutions and other quirky visuals. The owners of Das Neue Kubitscheck in Munich are really serious about one thing: no doilies! 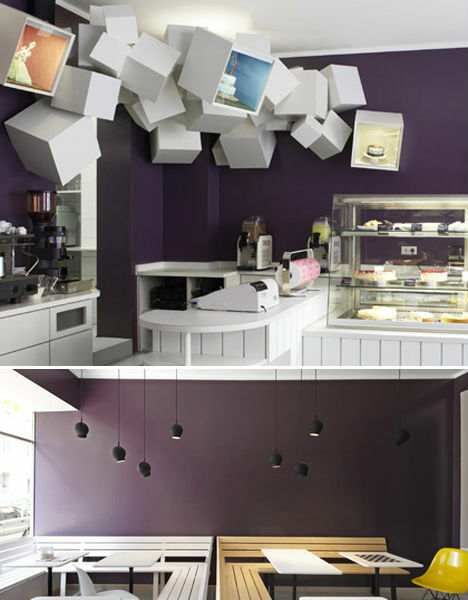 The self-described ‘punk’ Armin Stegbauer revamped a 1950s patisserie into an elegant and contemporary cafe with fun details like a sculptural installation of ‘cake boxes’ in a corner. With a rallying cry of “F#$%! the cake mix”, Stebgauer made the cafe multifaceted and dynamic – without a doily, that common decorative item in cafes of old, in sight. 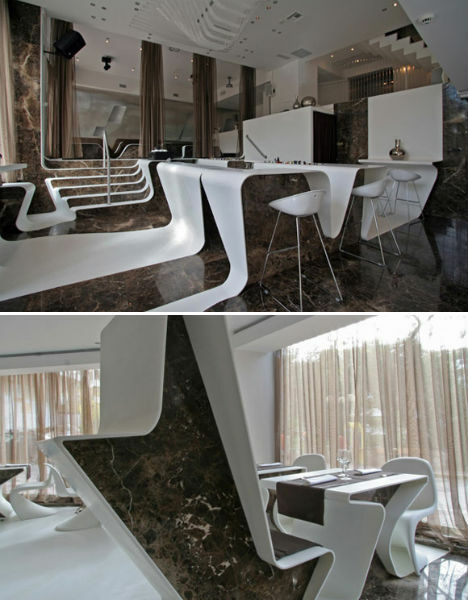 Ribbons of white form continuous bands across the surface of the St. George Lycabettus Cafe in Greece, extending from the wall, over the tables and onto the floor. Contrasting with dark gray marble, the white surfaces draw the eye along the entire space.The cafe is located inside the St. George Lycabettus Hotel, among the best lodgings in Athens. A faceted wooden bar forms the focal point of a modern cafe on the ground floor of the Muzeum Sztuki in Lodz, Poland. 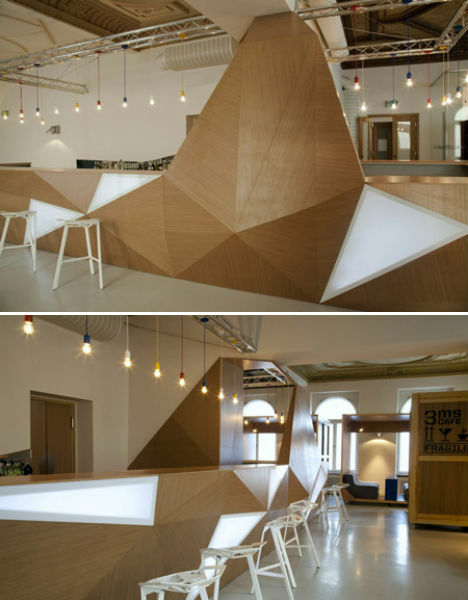 Made of wooden triangles, the bar also features panels of translucent plexiglass that are back-lit for a glowing effect. The cafe also features mobile wooden booths on wheels. The East Beach Cafe in Littlehampton, England certainly stands out among the more traditional buildings of the area. 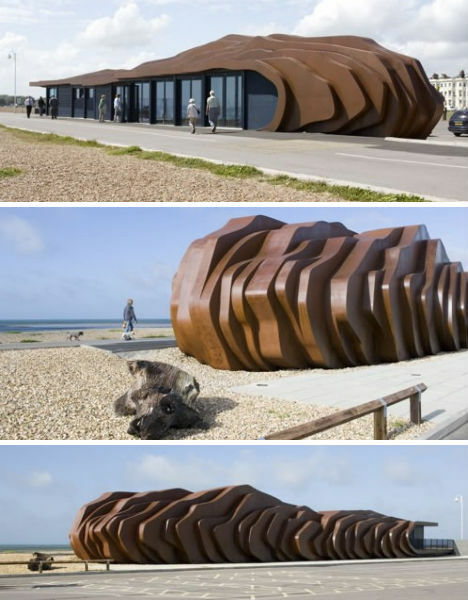 Winner of a number of architectural prizes including the Royal Institute of British Architects regional prize, the cafe has an unusual design made up of stacked organic shapes in rust-colored steel. Architect Thomas Heatherwick wanted the structure to fit the “raw beauty” of its surroundings without being too literal with ocean-inspired themes. The cafe has reportedly had a “Guggenheim effect” on the town (referencing, of course, the Guggenheim Museum in Bilbao, Spain) drawing in tourists and gaining worldwide attention. 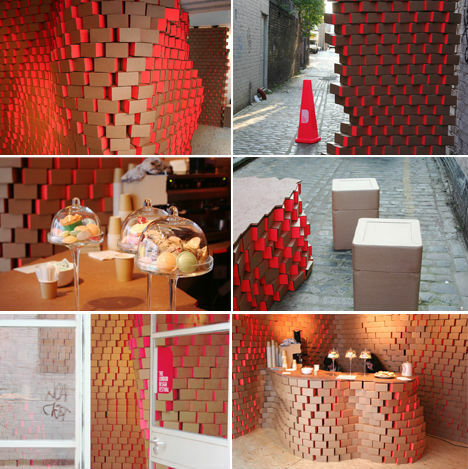 An incredible 8,000 cardboard boxes were used to create this ‘cardboard cafe’ by interior architects B3 Designers. Made for the London Design Festival in 2008, the cardboard cafe occupied the architects’ East London Studio, temporarily turning it into a bar. The boxes were painted and stacked to resemble bricks, and guests were encouraged to wear cardboard clothing. 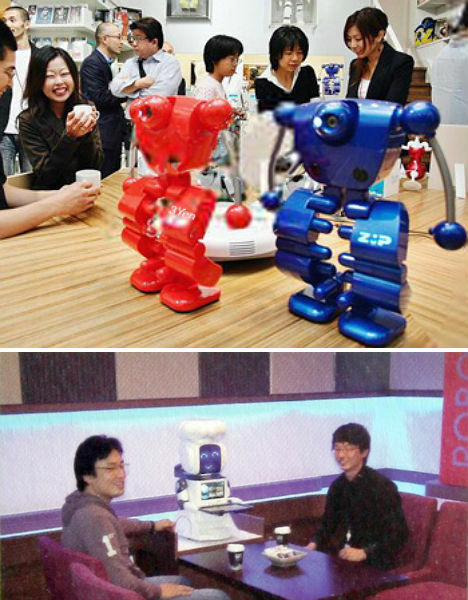 Don’t wait around for a human server at the Robo Cafe in Osaka, Japan – there are none. Instead, you have to place your order with the adorable miniature robots that run the place. When you’re done eating, a robot will even come out and clean your table. While at the cafe you can even purchase a robot to take home. When you walk into the D’espresso Cafe in New York City, you might find yourself a little overwhelmed at first: did you just enter a sideways library? What’s going on here? It takes a moment to realize that the effect of books on shelves, lining the ceiling and floors rather than the walls, is created using giant sepia-toned images printed on custom tiles. The ‘pendant lights’ are even installed ‘sideways’ to encourage the illusion. 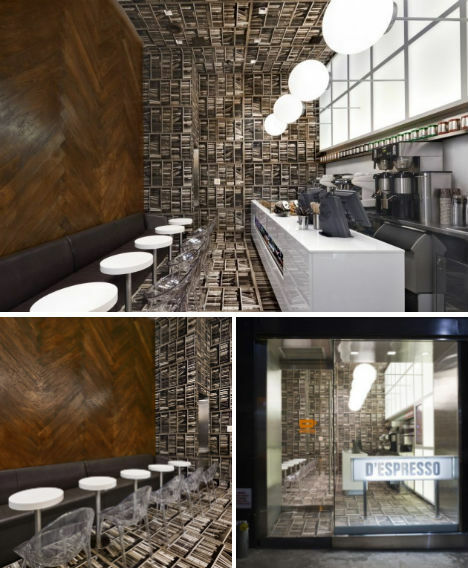 This unusual design, creative yet quite simple in its execution, gives the D’espresso a one-of-a-kind atmosphere. The fittingly named Purple Cafe is, unfortunately, not a real place – at least, not yet. 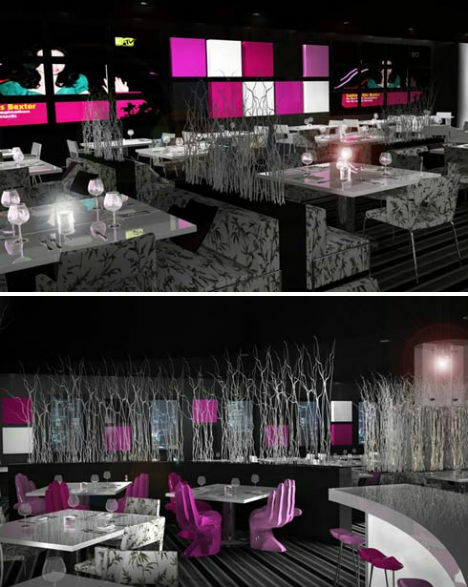 This concept design by Jan Schriener imagines a restaurant in virtually all shades of purple from lilac to eggplant, contrasting soft, relaxing design details like an installation of branches with bright, geometric lighting and art. 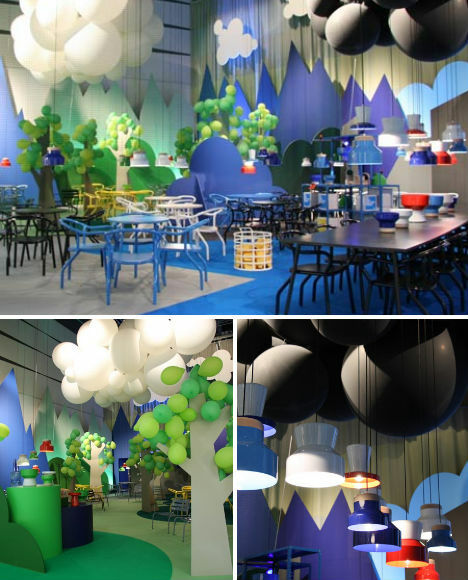 The Stockholm Furniture Fair was transformed into a cartoonish wonderland with giant balloons and colored paper. Swedish designer Jonas Wagell created the Design Bar installation in two sections, ‘the forest’ and ‘the industry’, the latter represented by black ‘clouds’ and smokestacks. “I want to use small means and simple materials to create an environment with grand expressions and strong character. Trade fairs are temporary structures, hastily erected only to be torn down within days. Instead of building an environment that tries to be something more than this, I see an exciting challenge in embracing the temporary and creating a spatial presence with a glance at stage design and graphics, rather than glamorous, polished architecture,” Wagell said. 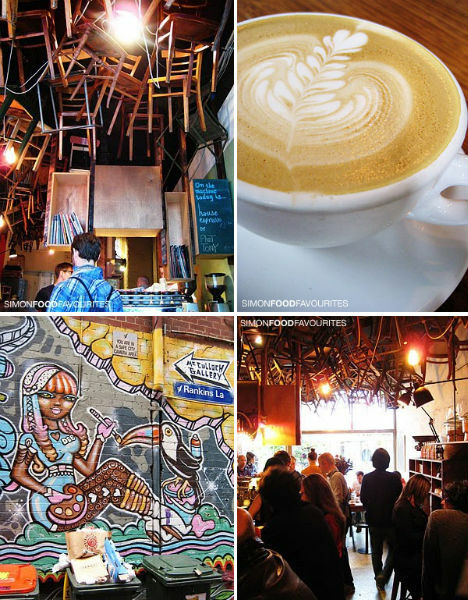 Brother Baba Budan is not just a Melbourne favorite because of its coffee, reputed to be among the best in the city. It’s also notable for its fun and slightly chaotic décor, which includes an installation of wooden chairs hanging from the ceiling. It’s certainly a simple, inexpensive yet unforgettable way to make your cafe internationally known. Giving the impression of a building shell placed lightly upon a pre-existing parking lot, Cafe/day by Suppose Design Office continues the exterior asphalt floor into the interior, traffic markings and all. 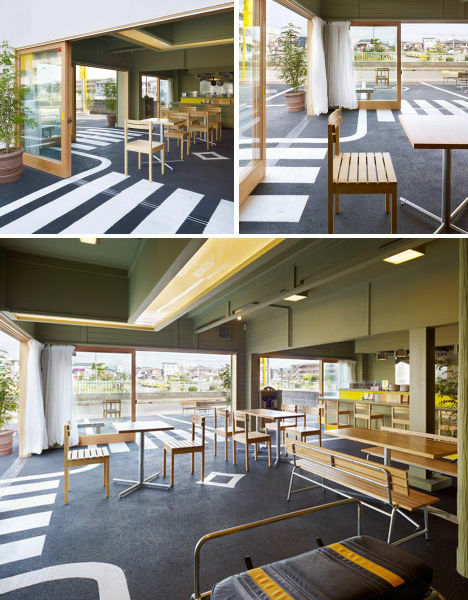 Located in Shizuoka, Japan, the cafe features benches modeled on bus stop seating and chairs made of recycled car seats. With its large glass walls and unusual flooring solution, Cafe/day extends this casual space of relaxation out into the urban environment. 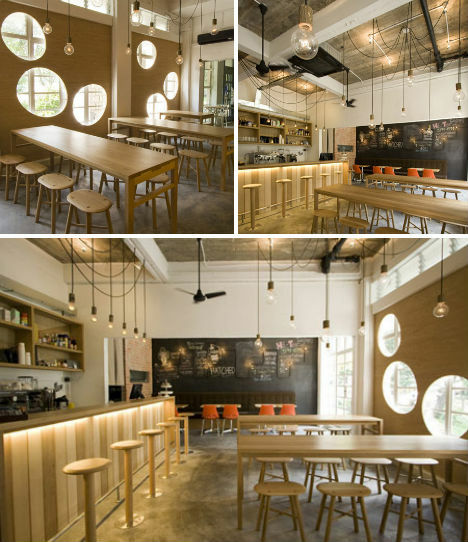 Egg-shaped windows dot the wooden walls at Hatched, a Singapore cafe by design collective Outofstock. Located in an old dormitory next to a university campus, Hatched is a casual restaurant serving breakfast all day, and it communicates this hominess with warm, welcoming wood and aged brick. It’s not just the juxtaposition of patterned stone bench tops and timber floors against stark white walls that make Melbourne’s Cafe Vue stand out. 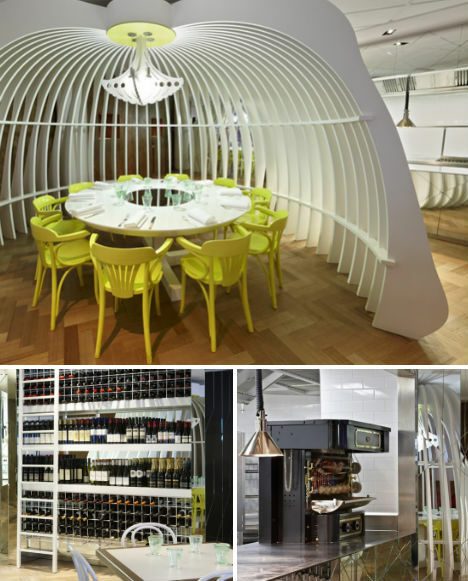 Rather, it’s the strangely sculptural details dreamed up by designer Elenberg Fraser, like the white cage-like structure that surrounds one of the tables, and the guillotine-shaped light that hangs above it. The design is a modern twist on the aesthetics of the Versailles Palace and Marie Antoinette. As the leading Natural Stone Supplier of an extensive range of Marble tiles and slabs, Marble Sinks, Travertine Tiles and slabs, Limestone Tiles, and other premium natural stone products in Australia, Euro Natural Stone strives to offer its customers the stone of unrivalled beauty and rarity at the best possible prices.